Book by Book Publicity, Reader Views, Author Interview, Interview with Bill Adler Jr. Author of "No Time to Say Goodbye"
Interview with bill adler jr.
Bill Adler Jr. is the author of many books, including “No Time to Say Goodbye,” a time travel love story, “The Binge-Watching Cure,” a short story anthology, “Tell Me a Fairy Tale,” a storytelling guide, and “Outwitting Squirrels,” which the Wall Street Journal called “a masterpiece.” He’s the publisher at Claren Books, www.clarenbooks.com, a fiction publishing company. Adler grew up in New York City, went to college in New England, lived for two decades in Washington, DC and now makes his home in Tokyo. He's a licensed pilot and unlicensed writer. Welcome Bill, and thank you for being with us today! Why don’t you start by telling our readers a bit about your journey to becoming a published author? I started to write seriously after being disillusioned with being a lobbyist in Washington, DC. Although I worked for a public policy group fighting for what I believe to be truth, justice and the American way, the ways of Washington, DC were too stressful and unfulfilling for me. I was fulfilled by writing. I started writing nonfiction. My early books include “The Student’s Memory Book” and “Outwitting Squirrels.” I had more ideas than I could write, so I started to package books: I’d write the proposal, then I’d find a writer and a publisher and put the two together. It was fun developing book ideas. Packaging led to agenting books, which I did for nearly two decades. Unfortunately, when working as an agent I had little time in which to write. Now I’m no longer agenting, so my time is my own. And although I have a small book publishing company, Claren Books, I’m able to devote significant time to writing. What is “No Time to Say Goodbye” about? “No Time to Say Goodbye” is a time travel love story. Dennis, the main character, is moving forward in time, first in small increments, and then in larger, grand leaps. With each leap into the future he moves farther and farther away from his friends and his wife, Rachel, with whom he is madly in love. Once Dennis and Rachel understand what’s happening to Dennis they race against time to find out what’s making Dennis move forward in time...and to stop it. Tell us about the protagonist in the book, what motivates him? All Dennis wants is to love his wife and be the best doctor he can. When he finds himself traveling forward in time, he loses the most precious things in his life. When he realizes that, a blanket of despair covers Dennis. Can you relate to Dennis on a personal level? If so, how? Like Dennis, what I want most is to be happy, to love and be loved. I moved halfway around the world, to Japan, for that. Why does time travel excite readers so much? Time travel stories are the ultimate exploration of what-if? Time travel stories make us think about our own lives with a strange, sometimes uncomfortable microscope. What if I hadn’t been at that party? What if I’d taken an earlier train the day I met my future spouse? Then of course, there’s the wondrous possibility of undoing our mistakes that time travel offers. How great it would be to live without regrets. Is there a secret to writing novellas? Novellas need a consistent, fast pace. There’s not much room for character development through flashbacks. When somebody reads a novella, they’re interested in bite-sized fun, and that’s what the writer needs to deliver. What is the future of novellas in book publishing? The chapter on the future of novellas has yet to be written. A lot depends on Amazon, as does so much with book publishing. Amazon likes novellas, but if the giant decides to really push them will novellas become as popular as they deserve to be. What kind of reaction to your writing do you most seek from your reading audience? 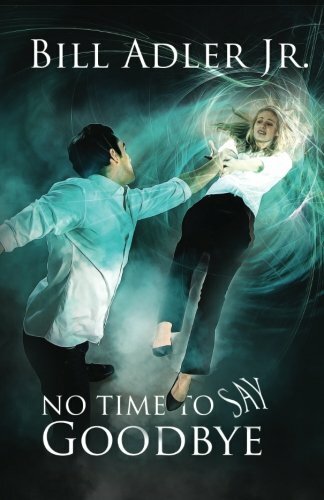 One of the criticisms of "No Time to Say Goodbye" is that readers and reviewers wanted to see more — they wanted to know what comes next. The novella ends when Dennis...oops! – a spoiler, so I won’t say more, other than I left more than a few threads unsewn. Although I agree with reviewers who say the novella is unfulfilling because it leaves many questions open, I like that reaction: Readers wanting more, rather than wishing I had ended the novel a hundred pages sooner. What is a typical day for you as an author? What are your writing practices? Here’s where reality and fantasy diverge: I’m not a morning person. I’ve tried and tried, but I can’t start my writing day at 7 AM, as much as I’d like to. I’d like to sit at my desk and write a half dozen pages before dawn, but that will never happen. The other time block that’s not mine is between about 2 PM and 3 PM when my cat insists that I lay in bed so she can lay on top of me. So here’s how I write. I write whenever and wherever I can. I jot down ideas into Evernote the moment they wink into existence. I’m never far from my Chromebook, no matter where I go. I keep a Chromebook by the side of my bed, too, and often write there. How do you feel when you finish a writing project? I’m nervous after I finish writing a book. I wonder if my writing is crisp and exciting. I wonder if the characters ring true. I’m concerned that the plot isn’t exciting enough. I fret over dialog. I worry about every single mistake I could possibly have made. But once I start working on a new project, I’m happy and quickly forget my worries. I’m a Stephen King fan. A long time ago I had a difficult breakup. I picked up Stephen King’s epic, “The Stand.” That carried me through the hardest days following the breakup, and I’ve been a Stephen King fan ever since. Not to mention, can he ever write. Why do you publish books, as well as write them? The book world is fun. Not just writing, but publishing, too. I get this energized, electric feeling when I bring a book out that I know people will enjoy, whether it’s something I wrote or something I’ve published. I enjoy finding new ways to promote books, too. For example, “No Time to Say Goodbye” has a theme song, the first theme song ever written for a novel (or novella). What kind of fiction is most enduring? Of all the genres, what lasts the longest and holds up best over time? Horror. Look at Edgar Allen Poe, Robert Louis Stevenson, and Mary Shelley. Their books will be read forever. Civilization can survive without love — you don’t need love to make babies. Civilization can survive without surprise, anger, disgust, even happiness. But without fear, we’d have been eaten by lions long ago. Read. Read and think about what you’re reading. Why do you like it? How could that book have been improved? Would you have written what the author you’re reading wrote? How would you have developed characters differently? I read for pleasure, but it’s also a treat to know that when I read for pleasure I’m improving my own writing. What advice can you give aspiring authors? Find a good editor and learn from that person. Few people are born good writers. We learn from our mistakes, but only if we have somebody who can point out our mistakes. That editor, by the way, can be a critique partner. He or she doesn’t need to be a paid editor, as long as your editor is smart and honest — and you pay attention. What’s next, do you have another project in the works? I’m working on developing “No Time to Say Goodbye” for television. Will that happen? I don’t know, but I want Dennis’ life to continue. I’m also writing a Japanese ghost story, Akiko and Peter: Into Eldritch Island, which is just about finished. Akiko and Peter is a novel of six interconnected stories about a Japanese woman and American guy who regularly encounter ghosts and monsters. Where can readers connect with you on social media to learn more about “No Time to Say Goodbye” and your other books? I spend too much time on Twitter, @billadler. I’m also on Facebook, www.facebook.com/billadlerjr. My website is www.adlerbooks.com. Is there anything else you’d like to share today? For writers: The moment an idea, plot thread, character quirk or other thought pops into your head, write it down. If it’s in the middle of the night, write it down. If you’re in the bathroom, write it down. If you’re taking a shower, use a soapy finger to write your idea on the wall or shower door. Ideas that aren’t put down on paper have a lifespan of no more than forty-five seconds. Will your idea be a good one? You’ll never know unless you remember it. For readers: Buy books. Don’t worry about whether you love the book or not. As with anything and everything in life, like food, movies, boyfriends and girlfriends, a new job, even a trip down memory lane, you might love it, hate it, or be indifferent to it. Books aren’t expensive, so you can take a risk with a book.